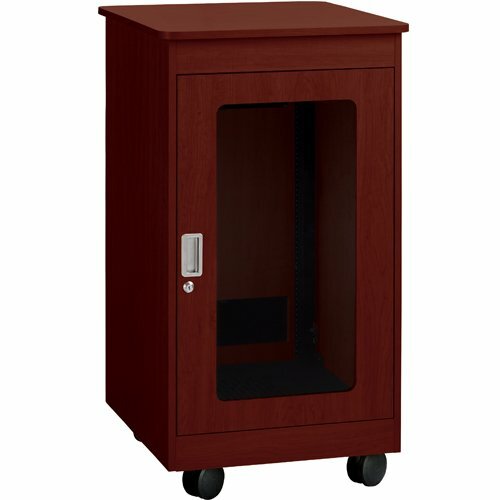 YF1F2828H Color: Mahogany Features: -3U Panels in rear door can accept fan panels or vent panels. -Rack ships with solid steel filler panels in rear door 3U openings. -Rack has a steel frame under the wood outer covering. -Made in the USA. Product Type: -Cabinet system. Size (Unit): -21U-30U. Finish: -Maple. Door Included: -Yes. Wheels Included: -Yes. Application: -Pro A/V. Frame Type: -Open. Thermal Management: -Passive. Stand-Alone: -Yes. Weight Capacity: -500 Pounds. Commercial Use: -Yes. Finish: -Mahogany. Finish: -Black. Generic Dimensions: -Caster: 4" W x 4" D. Dimensions: Overall Height - Top to Bottom: -62 Inches. Overall Width - Side to Side: -26.63 Inches. Overall Depth - Front to Back: -30 Inches. Interior Depth - Front to Back: -26 Inches. If you have any questions about this product by Raxxess, contact us by completing and submitting the form below. If you are looking for a specif part number, please include it with your message. DWR Series Space Sectional Wall Rack Finish: Black, Rack Spaces: 35U Spaces, Depth: 20"